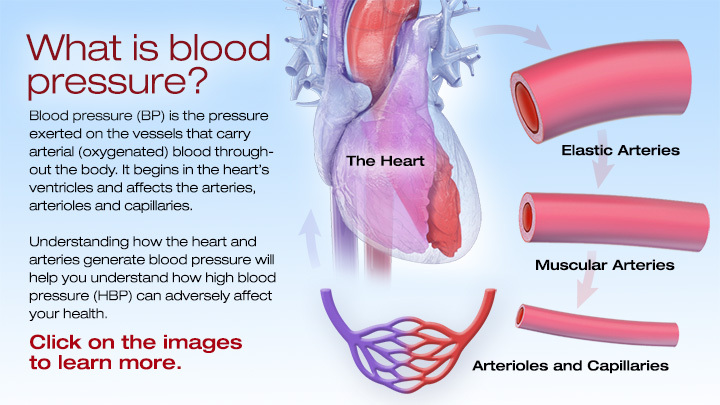 High blood pressure or hypertensionis when a person has abnormally high pressure against the walls of their blood vessels. This condition develops gradually over many years and may go unnoticed for a long time, as there are often no symptoms. Gender. Men are more likelyto have high blood pressure before the age of 55, but women are more likely than men to have the condition after the age of 55. Lifestyle habits. A lack of physical activity, smoking tobacco (including second-hand smoking), drinking too much alcohol, consuming too much salt (sodium) or too little potassium, and stressmay increase the risk. Stroke. A strokehappens when there is a block in the flow of oxygen-rich blood to the brain, preventing that portion of the brain from getting oxygen. Aneurysm. An aneurysmis the development of an abnormal bulge in a blood vessel wall, which may press on other organs, block blood flow, or eventually burst. Age. People older than 65are more likely to experience a drop in blood pressure while standing up, or after eating. Children and young people are more likely to experience a rapid drop in blood pressure accompanied by dizziness, blurred vision, and fainting, which is known as neurally mediated hypotension.